Here at the Syracuse Poster Project, a lot of haiku submitted and contributed by our fine poets, highlight observations and sensory experiences found in the world around us. Topics run the gamut, from Mother Nature to our love of music, holiday celebrations and even sporting events! To celebrate March Madness — the kind of madness when hoops, top seeds, Selection Sunday, brackets and hopeful Cinderella’s, take on a life of their own — we’ve opened up our archives to some fun haiku with an eye on Basketball! Spoiler Alert: What with Syracuse University in our front yard, many of the haiku presented below highlight the Syracuse Orange games held at the Dome on the SU Hill. the shot’s up, it’s in! Our featured haiku poster is from our 2008 Series. The colorful haiku was written by poet, Pat Flowers and beautifully illustrated by former Syracuse University Illustration student, Gabe Eng-Goetz, now working as a professional artist and designer; he is also the founder of Runaway. From the 68 teams selected from across the country, to the Sweet Sixteen, to the Elite Eight, and down to the Final Four, March Madness is certainly an exciting tradition to welcome Spring! This year’s wintry mix of weather has not dampened the spirited shenanigans of St. Patrick’s Day revelers here in Central New York. From parades and concerts to hearty helpings of corned beef and cabbage, St. Patrick’s Day is one of our favorite holidays! From our archives, please enjoy these cheerful haiku dedicated to this Irish celebration! Parades, Irish music, food and drink, are among the ways we celebrate St. Patrick’s Day. It’s a day to revel in the sounds of bagpipes, bodhrans, Irish flutes and fiddles! And, it’s a great day for Irish dancing and singing of Danny Boy! It’s a day that would be incomplete without corned beef and cabbage or a frothy Guinness Stout at your favorite Irish pub. Best of all, St Patrick’s Day is a sweet prelude to warmer weather! Our featured haiku poster on this special occasion is from our 2007 Series. The cheerful haiku was written by Jennifer Sanford and the poster beautifully illustrated by our own, Joseph Murphy, when he was an illustration student at Syracuse University. Joe is one of our Board Members; you can learn more about his work, here. Valentine’s Day–a sweetheart of a day, dedicated to the celebration of love! Symbolized by red hearts and roses, chocolate kisses and candle-lit dinners, whimsical cards and love poems, it’s one of our favorite days of the year! Haiku being our forte, we’re often searching our archives for poems and haiku posters that perfectly fit an occasion or holiday. For this St. Valentine’s Day post, we come back to these wonderful haiku from our talented contributors. path where love finds me. Speaking of love and romance, it might be frightfully cold outside, but our featured 2007 Syracuse Poster Project haiku poster is sure to warm you up on this St. Valentine’s Day. The poet is long-time Syracuse Poster Project contributor, Robert Gaurnier; the poster was illustrated by former Syracuse University Illustration student, Bret Supranowicz, now working as a designer and illustrator in New York City. If you’re stuck for an idea for something special to give your sweetheart, feel free to download one of our specially commissioned St. Valentine’s Day cards here. As we have done in years past, each of our Valentine’s Day cards are created with a wonderful background and enough space to give you an opportunity to write your own love poem. Our 2019 card can be downloaded here. It was artfully designed by Jiaqi Liu, our Spring semester graphic design intern. clouds and ice and salt. As dryly described in Matt Tompkins’ (Owego 2013) haiku above, this January has been cold and snowy–and everything else inbetween! Haiku has the perfect ability to express these Winter days in such a way that you can nearly forget it’s January…well, almost! It’s too early for Spring Fever, so try warming up with these few haiku found in our archives and written by our wonderful contributors. When it’s not too cold or blustery, January offers a great time to be outdoors. In his colorful haiku, poet Lee Savidge (Liverpool 2013) sets the mood for a day of skiing. Can you feel the anticipation?…the thrill of a good day on the slopes?…not noticing the cold on your face? Speaking about enjoying outdoor activities during the Winter months, it seems only appropriate that we feature once again, this rich haiku poster from our 2014 Series. The haiku, with a wonderful play on words, was written by Dianne Emmick and richly illustrated by former Syracuse University student, Ash Merkel. Cars trapped in driveways. / Skiers glide softly mid—street / Making morning tracks. All in all, when you have a haiku warming your insides, January isn’t too bad! Do you have a Winter haiku to share? Send it in the comments below and we will post it in our next Blog! Parades, Irish music, food and drink, are all hallmarks of how we celebrate St. Patrick’s Day! It’s a day that would be incomplete without corned beef and cabbage or a frothy Guinness Stout at your favorite Irish pub! Best of all, St Patrick’s Day is a sweet prelude to warmer weather! Syracuse Poster Project is celebrating St. Patrick’s Day with haiku, of course, and we’re offering a specially themed poster from our 2014 Series at a 10% discount from our online shop here. The well-crafted haiku was written by self-published poet, Seneca Wilson, and colorfully illustrated by former Syracuse University Illustration Student, Erick Friely, now a professional Illustrator and Visual Development Artist based out of Oakland, CA. Learn more about Erick’s work here. We’ve even made a video of this fine poster for your viewing pleasure! Click here to view! If you follow us on FaceBook and Twitter, or if you receive our newsletter, you know that St. Valentine’s Day is one of our favorite occasions! Over the last couple of years, besides highlighting love-themed haiku from our archives on this Blog, we have offered St. Valentine’s Day cards to download–free of charge–from our Website. With some, by adding your own words of love with a specially commissioned drawing, you have the perfect card for your special Valentine! For this year’s card, we turned to long-time friend of the Syracuse Poster Project, William Padgett, for both his design skills and for his aesthetic and poetic sensibility. To view and download this latest addition to our special collection of St. Valentine’s Day cards, check out the “Free Stuff” section of our Website. Pictured below, this year’s card celebrates both St. Valentine’s Day and the 2018 Winter Olympics. Cold Ice, Warm Heart. Happy Valentine’s Day! And….speaking of the many ways we express love, please enjoy our featured haiku Poster below from our 2013 Series. The poster’s warm haiku was written by Tom Rhoads, who comments, “This particular haiku is really just about the love and loyalty of an old friend and how that love and loyalty is a special joy.” The poster was illustrated by former Syracuse University Illustration Student, Katie Hampton, now a Massachusetts-based artist/designer currently working as a Digital Production Design Specialist at Forrester Research in Cambridge, MA. Check out her collection of wonderful work here. Old and loyal friend, waking to find pure fresh snow, leaps like a puppy. If you like this poster, you can find it for sale in our Shop section of our Website here. This February, have a wonderful St. Valentine’s Day! Enjoy the Winter Olympics! And, stay warm! Warm Weather on Your Mind? Our latest newsletter teases us out of our Winter doldrums with a wonderful haiku poster from our 2013 Series showcasing Columbus Circle on a bright Summer’s day. Written by Ricky Maeweather and illustrated by Walter Kampf-Lassin, this wonderful scene certainly allows us to forget–even for a moment–the cold, dreary weather we’ve been having this January! It will be a few months yet until the sun warms us up as it does in this bright haiku poster, but we are always warmed by the responses we receive from our followers to things we’ve written about in our newsletter–and, our blog! How simply marvelous…can you feel the warmth, now, of a soft, sunny blue day in January? Thank you, Patricia! So, hang in there all you Central New Yorkers…it’s almost February!! **If you’d like to join our mailing list to receive news about our activities, invitations to submit poetry and notices of shopping deals, please contact us here. We’ll keep you informed by email and occasionally by direct postal mail. Rest assured, we do not share contact information or email addresses. Typical of January, it’s been cold and snowy–and everything else inbetween–as mischievously described in Matt Tompkins’ (Owego 2013) haiku above. Dark frigid nights seem to last forever this time of year, too, though daylight is (thankfully) lasting longer. Haiku has the perfect ability to express these Winter days in such a way that you can nearly forget it’s January…well, almost! Try warming up with these few other haiku found in our archives and written by our wonderful contributors. When it’s not too cold or blustery, January offers a great time to be outdoors. In this colorful haiku, poet Lee Savidge (Liverpool 2013) sets a sensory mood for a day skiing. Can you feel the anticipation?…the thrill of a good day on the slopes?…not noticing the cold on your face? Reminiscent of the first ‘no school day’ of January, our featured haiku poster is from our 2014 Series. The haiku, with the wonderful play on words, was written by Dianne Emmick and richly illustrated by former Syracuse University student, Ash Merkel, now a working artist whose fine illustrations, sketches and ceramic work can be found here. At long last, it’s coming on Summer! From our archive of contributed haiku, we’ve found a few to highlight the return of this sunny season. Cool clover carpet seduce my bare feet with dew Summer night, you muse! The arrival of Summer also means weekends are suddenly booked with music festivals, sporting activities, sun gazing and weddings! Our featured poster from our 2004 Series notes this traditional season for wedding celebrations with a cleverly written haiku by Ralph Long, Jr. and a beautiful illustration by Elizabeth Couturier, former Syracuse University Illustration student. How do you welcome Summer? Write us a haiku in the Comments and we’ll publish it next time on our blog. We are pleased to report that our 16th Annual unveiling event of the 2017 Syracuse Poster Project Series on April 14 was a great success! Along with their families and friends, several of our featured poets, artists and students turned out for this yearly Spring celebration. and tasty Hors-D’oeuvres by Creole Soul Cafe, the evening moved smoothly from brief introductions by Jim Emmons (co-founder of the Syracuse Poster Project) and John Thompson (Illustration Professor at Syracuse University) to the haiku readings and acknowledgements of the night’s Poets and Artists. or our dedicated Sponsors and Supporters (click here to read more)! Special thanks, also, to our evening’s photographers, Mindy Lee Tarry and Herm Card. Once again, the Atrium, at the City Hall Commons, proved to be the perfect spot to exhibit the kiosk-sized haiku posters. The excitement upon entering through the Atrium doors was unmistakable! What a thrill to slowly walk down the exhibit hall, watching poets find their poster, listening to artists and poets meeting for the first time, mingling with the crowd and oohing and ahhing at every poster! On May 1, the new 2017 Series Posters were mounted in specially designated kiosks throughout the downtown Syracuse area. They are also for sale on our web page. In fact, check out our online store here for all our haiku posters, cards, books and other Syracuse Poster Project paraphernalia. If you missed the fun–or just want to relive it–check out this video featuring our youngest poet, Kiru Morrissette, whose haiku was illustrated by Kelly O’Neill. You will find other short videos of the evening by clicking here! A very special thank you to our volunteer, Priya Balaji, for catapulting us into new video territory with these wonderful shorts! Reading Haiku & Talking Art! Go to our Facebook page to see other photos from the evening’s events! Our thanks, again, to all who made this a very special evening of community, poetry and art! The promised light of December’s Winter Solstice seems to have temporarily disappeared behind grey clouds this January in Central New York. Along with cold temperatures, lingering patches of icy dirty snow have also made for some rather bleak days here. But for the brief moments of morning sun, or the colorful flight of cheerful Cardinals and noisy Blue Jays, cloudy skies remain the dominant trademark of Winter in Syracuse. While a backdrop of grey is not wholly unexpected this time of year, we certainly could use some clear, blue skies! As you might expect, writing haiku brings a whole new perspective to cloudy and grey. And, it’s a perfect antidote for cabin fever. Digging through our archives of wonderful haiku contributed over the years by Central New York poets, we found a few which might give you pause to reflect before going completely stir-crazy! Frequent Syracuse Poster Project contributor, Janine DeBaise (Kirkville 2002) and Associate Professor of Printmaking at Syracuse University, Holly Greenberg, worked together to create this remarkable poster from our 2006 Series. Clearly, you can find beauty on a stark Winter’s day. Hope you’ve enjoyed these few samplings from our archives. It’s wonderful how writing Haiku provides a way of expressing deep emotions and seeing nature from a variety of perspectives with just a few words. So, when Winter’s grey is making you blue, write a Haiku! Every year, it seems, we assure ourselves that Autumn will be as colorful as the year before–our memory clearly remembering the rich Fall colors of years past. With such a dry, hot Summer of 2016, the theory was there’d be no color to witness this Fall. Thankfully, that didn’t happen! We think you’ll agree, this year, Autumn in Central New York has surely outdone itself what with its brilliant and long-lasting shades of red, red-orange, orange and golden yellow–even shades of mauve dressing the leaves of certain trees! Frequent Syracuse Poster Project haiku contributor, Bethaida Gonzalez (Syracuse 2014) and former Syracuse University Illustration Student, Anna Ellis, combined their love of Autumn in this charming poster from our 2015 series. Autumn–it is a season of color, earthy smells and the rustling sounds of leaves flying. What is your favorite sensory experience of this season? We’ve chosen only a few of the many beautiful haiku we have in our archives about Fall to share with you here–write us your thoughts in the comments below and we’ll share them in the next blog. As it’s done every mid-August since 2001, Syracuse Poster Project has announced its annual call for Haiku for its upcoming 2017 season. Entering its 16th year, Syracuse Poster Project invites you to participate in this annual call for Haiku. Consider this as an opportunity to contribute to the culture of our City–as your submitted haiku has the chance of becoming an illustrated haiku poster! In fact, if your haiku is chosen to be illustrated by a senior Syracuse University Illustration student, it will be on display for one year following our unveiling event in April! Each of our illustrated haiku posters uniquely enhances downtown Syracuse: mounted in the City’s colorfully painted kiosks, Syracuse Poster Project posters celebrate the area’s four distinct seasons, our favorite Syracuse area pastimes, our community celebrations and events. Our posters, like our mission, continue to bridge art and poetry within our community and with our Central New York neighbors. This year’s call for Haiku is especially noteworthy as we are also paying special tribute to the Erie Canal’s 200th birthday! Officially, the commemoration of this notable bicentennial of the historic Canal begins in 2017. Syracuse–and many of the towns, cities and villages along the Erie Canal Corridor–will be hosting events and festivities to celebrate this iconic landmark. Coincidentally, Syracuse has the distinguished honor of hosting the World Canals Conference in September 2017. Learn more about the Erie Canal here; about the NYS Canal Corporation which manages the Canal here. You can contribute to the Canal’s bicentennial festivities by writing a haiku to complement our special Erie Canal poster! Displayed below, this colorful poster was commissioned for our special tribute by Tong “Amy” Su, a graduate student in the Syracuse University Illustration Program. 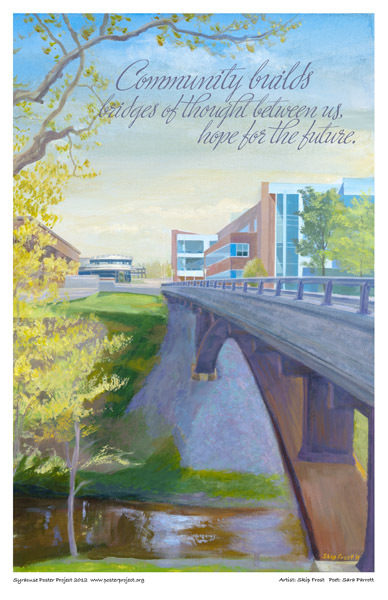 If the Erie Canal, its history and its future intrigue you, consider submitting a haiku to complement Su’s charming poster! Visit our website for entry materials and further information here. If you are new to Syracuse Poster Project, the 2017 poster series will consist of 15 posters created the traditional way (poem first, illustration second) and one special poster created the reverse way (illustration first, poem second). Poets may submit up to three haiku to the traditional contest and one haiku to complement the Canal poster. We request that your Haiku have three lines of 5, 7, 5 syllables; no need for title lines. Need inspiration on writing haiku? Look here for our wide selection of books on writing haiku, books about haiku artists, and compilations of our own archived haiku contributed by Central New York poets. The entry deadline for your haiku is Sept. 9. Poets will be notified if their haiku was selected for a poster in early December. Our unveiling event happens in mid-April–and what a fun evening it is! To download an entry form, click here. To download the Call-For-Haiku brochure, click here. If you would like to download a sample of the Ms. Su’s Canal poster, click here. If you are an elementary and / or secondary school teacher, we would love to hear from you and your students, too! Several posters have featured student poems and we enjoy the vision and spirit of student work. If you have your class participate, please help with the selection work. For each class, send us the best five haiku. Thank you. And, don’t forget, all our posters are for sale on our website, here. You will also find them on display locally as our traveling exhibit brightly lines the walls of area restaurants, cafes and college campuses. It’s difficult. Finding the right words to use when tragedy strikes. Again. When lives are cut short. Not wanting to sensationalize. But, wanting to say something. Something that will support, comfort and soothe. Our archives hold many haiku describing love, hope and the clear, simple splendor of Nature. We’ve chosen only a few with the hope that you will find solace in their words. Our featured poster is from the 2010 collection. The beautiful haiku was written by Peggy Liuzzi and the gorgeous illustration by former Syracuse University Illustration Student, Alec Acevedo, now a freelance illustrator and in-house artist for Jay St. Video Games in Pittsfield, Massachusetts. Pulse. We are touched and saddened by what’s happened in Orlando. One of many horrific events that will be in our hearts for a long time…like Sandy Hook, Aurora and Columbine, San Bernardino, Ft. Hood, Boston, Charleston, Oklahoma City…. Though the Summer Solstice is still three weeks away, Memorial Day Weekend and the first week of June, essentially welcomes Summer! And now with the season of fun in the sun officially underway, so are its many celebrations, including outdoor festivals, concerts, craft fairs, art shows, field days, Highland Games, baseball games, boating events…we could go on forever! And, believe it or not, there are haiku from our archives that fit nearly every summertime occasion imaginable! For instance, during the first weekend in June, the Taste of Syracuse event in Clinton Square has celebrated the opening of Summer for the past 20 years. Food tasting and music dominate downtown Syracuse for two days and two nights. Our illustrated haiku poster from the 2011 collection gives you an idea of the crowds that have enjoyed this annual event. The poster was created by former Syracuse University illustration student, Rebekah Mackay, and written by frequent Syracuse Poster Project contributor, Robin Gross. What’s your favorite Spring into Summer festival? Syracuse Poster Project is proud to announce the unveiling of its 2016 collection on Thursday, April 14. Our festivities will be a gathering of poets, artists, friends and other supporters of public art. Food, drink, music and of course, a display and haiku reading of each of the 16 new posters will be served! This year’s merriment begins at 6:00 p.m. in the Atrium of City Hall Commons, 201 E. Washington Street, Syracuse. Click here and here to see photos from a few of our past openings and recent kiosk displays. 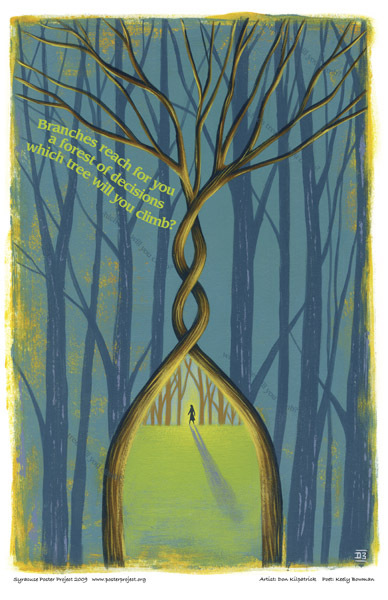 Branches reach for you / A forest of decisions / Which tree will you climb? Community builds / bridges of thought between us, / hope for the future. Our 2016 reverse process poster was created by artist and Syracuse University adjunct professor, Tim Coolbaugh. His captivating poster was spotlighted last August on our blog post: Meet the Illustrator of Our Dog Rescue Poster. In response to Tim’s poster, we received over 70 haiku submissions; five semi-final haiku were selected and then passed along to the artist for his decision. Of these five, Aubrey Joy Cooper’s (Auburn) haiku was selected to accompany Tim’s poster. Dare I hope again? / Human eyes reveal few truths. / Still, I hope once more. Our thanks to the many poets who submitted haiku for the 2016 poster series. We had an excellent response: approximately 100 of you submitting a total of 168 fresh haiku! Combined with submissions from past years, we had a total of 371 poems to pass along to our Syracuse Univeristy Illustration students whose efforts this year–as you will see–were outstanding! Our thanks to these talented student artists and their faculty members who have worked closely with Syracuse Poster Project since our very beginnings–we are fortunate and blessed to have you! Finally, our thanks to our wonderful volunteers without whom this event would not have been possible! Syracuse snow banks cover heat-seeking missiles of Spring daffodils. One of our many favorite posters from the 2009 Syracuse Poster Project Collection, written by longtime Syracuse Poster Project contributor, Jay Cox and illustrated by teacher and former Syracuse University Illustration student, Devin Scannell aptly describes this taut time between Spring and the last of March snows. It’s that time. The Ides of March, when the tables turned on Caesar, and the battle for power…oh wait… I mean, that time of year when the battles of March, played on basketball courts around the country, determine who will be the 2016 National Champion! Always hungry, March, Sub-zero gales, snow knives cut. Peaceful arc, tender spring. Hear eager March sun Turn Winter packed icy eaves To notes of spring song. A robin perches on the snowplow blade, singing its bright orange song. 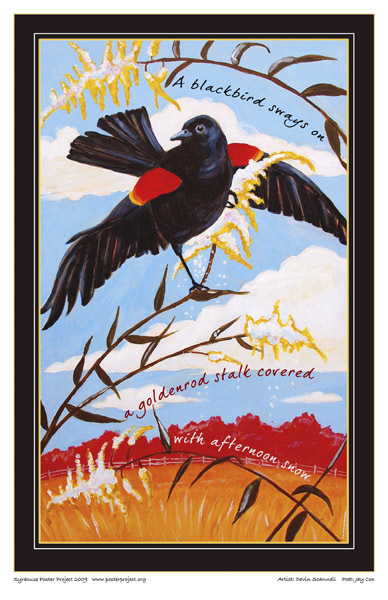 Speaking of the cheerful sound of birds, you can find this beautiful 2007 illustrated haiku on our Syracuse Poster Project Shop page. Poet: Claire Bobrycki and Artist: Mike Tanoory. Lion or lamb, March has a beautiful sound all its own. Listen for it and let us know what you hear! Valentine’s Day: a sweetheart of a day, dedicated to the celebration of love, symbolized by red hearts and roses, chocolate kisses, maybe a candle-lit dinner, whimsical cards and love poems. I chase the song of life. My heart knows the hidden path, where love finds me. Young opera moon, you caught us stealing kisses Under red awnings! This year, we at the Syracuse Poster Project, are celebrating Valentine’s Day by offering two, newly designed and downloadable, Valentine’s Day Cards. Thanks to Zhongwen Hu, a native of China now studying for a master’s degree in illustration at Syracuse University, this Valentine’s Day card includes a text box for writing your own haiku. You can see more of Zhongwen’s work at her Behance site or her Instagram site. Our thanks also to Shiwen Su, another native of China who is also studying for a master’s degree in illustration at Syracuse University. Her delightful Valentine’s Day card has plenty of white space on its cover for writing your own haiku. You can check out more of Shiwen’s work at her Tumblr site. If you still stuck for an idea, you will find a couple of our older, and just as whimsical, Valentine’s Day offerings and other inspirational items by clicking here and here. If grey skies have got you blue, and you’re tired of the cold already, why not head down to Provisions Bakery & Restaurant in Armory Square. Serving warm comfort for breakfast and lunch, the newly renovated site is currently hosting our travelling exhibit of framed poster prints – a visual delight! Climb over snowbanks Navigate icy sidewalks Hot cocoa inside! What better provision for a cold Winter’s day! It’s Winter – isn’t it? Well, it’s officially Winter – or so the calendar says. The Season of Light, the Winter Solstice, New Year’s Eve – all behind us now. But for the balmy 50 degrees weather we’ve been having on and off since Thanksgiving, you wouldn’t know that it is January in Central New York. So, where’s Winter? Strange…I miss the snow. The endless blanket that tucks us in all winter. Thankfully, it doesn’t seem we will be having the long, bitter cold Winter we did last year – or like folks are now having in the Midwest. Regardless, this beautifully illustrated 2005 Syracuse Poster Project haiku poster – written by Ellen Agnew and illustrated by former SU Illustration student, Ivy Hickam – sums up the ‘warm’ side of Winter. Here’s to Winter and a Happy New Year! If you’ve been following our blog, you’ve noticed a lot of new energy. That’s thanks to our blogger, Rosalyn Carroll, of Manlius. Now that she’s gotten things rolling, we figure it’s time to introduce her. An aspiring writer and poet, Rosalyn has been writing haiku, poetry and short stories since high school. She enjoys music, theater and walking along the Erie Canal. We think you will like how she incorporates a variety of themes with haiku selections from our archives and with select posters from our collection of illustrated haiku. Rosalyn affords us new, creative opportunities, and we encourage you to participate by following her posts, reflecting, and commenting. In short, please join the conversation.